NECORD Deputy Project Director Mr.N.Puhendran and TRO Trincomalee district co-ordinator Mr.K.Mathavarajah discuss about the implementation of Trust Building Project at the site while some of the displaced people are seen clearing land. The Tamil Rehabilitation Organization (TRO) in Trincomalee district Friday inaugurated the Trust Building Project (TBP) which will include reconstruction of selected roads, Nadesar Veethi, Soosaiappar Veethi, Vel Veethi, School Veethi, No 1 Lane, No 2 Lane, No 3 Lane, Sirupiddy lane 1 and Sirupiddy lane 2 in the Kanniya sector. At the auspices time on Friday Mr.Mathavarajah inaugurated the project by dashing a coconut on a stone after TRO project officer Mr.V.Kalaivarnan lit the camphor. The stone was placed in front of the bulldozer, which was brought to the site to clear roads overgrown with shrub jungles as a preliminary step to enable the owners to identify boundary of their lands. TRO Trincomalee district director Mr.Mathavarajah dashing coconut at the auspices time inaugurating the TBP at Kanniya sector. This is the first Trust Building Project, which has been implemented by the NECORD with the TRO as a partner organization, in the Trincomalee district, sources said. As the first phase of the Village Rehabilitation Programme of the NECORD the TBP is being implemented to create trust and confidence lure the displaced community to return to their own lands. “Trust building measure is an innovative one adopted by the NECORD to encourage the community in active participation from the very beginning of the participatory rural appraisal stage,” said NECORD Deputy project Director Mr.N.Puhendran who participated at the inaugural event of the TBP at Kanniya. Kanniya village is divided into three sectors, Peeliyadi, Mankaiyootu and Kanniya. Since the signing of the ceasefire agreement small number of internally displaced families have returned to their lands voluntarily and settled in Peeliyadi and Mankaiyootu sectors in the Kanniya village but no official resettlement scheme has been implemented because of the destruction of infrastructure facilities and no demining has taken place. However not a single IDP has returned to the Kanniya sector beyond hot wells area where about five hundred families lived before 1990 as all four main roads and five lanes and public wells had been destroyed or could not be identified due to overgrown with jungle. 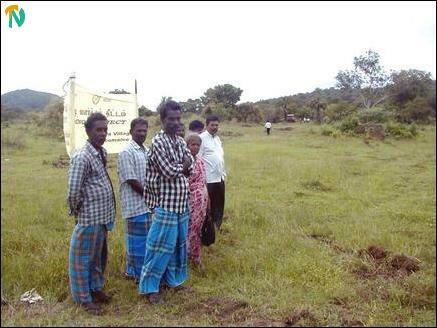 Kanniya sector Village Rehabilitation Committee chairman Mr.Ponniah Ramalingam in his abandoned land in Kanniya. It will be small project upto the value of four hundred thousand rupees to be completed within six months. The Government of Germany through German Technical Co-operation (GTZ) finances the Trust Building Measures, NECORD sources said. 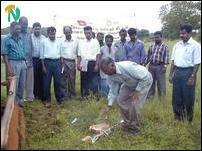 The abandoned cemetery would be rehabilitated under the World Food Programme, according to the Trincomalee Divisional Secretary Mr.Suntharam Arumainayagam. Demining of these roads and abandoned common wells would also be attended by the Danish Demining Group (DDG) Following repeated requests made by the TRO, DDG has now started demining the village, said TRO project officer Mr.V.Kalaivarnan. A Village Rehabilitation Committee (VRC) has been elected to take forward the TBP in the Kanniya village under the supervision of the TRO. 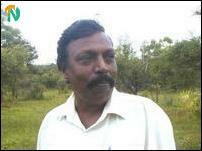 Mr. Ponniah Ramalingam has been elected President of VRC. Bulldozer moves into the abandoned land after the inaugural event. Mr Ramalingam who was born and bred in Kanniya village and forced to flee the area leaving his house and other properties during 1990 violence. He said only a mango tree has been seen in his land sans his house and other belongings. A group of the displaced people are present at the inaugural event at kanniya. He said about five hundred Tamil families lived before 1983. All were displaced in the 1983 violence. Some of them returned to the village thereafter. However they once again fled from the area in 1985 violence. But all the families about had been displaced in 1990 violence and have been now staying in refugee camps, welfare centres and elsewhere with their relatives awaiting the rehabilitation of their areas. 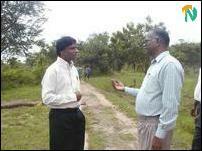 Trincomalee Divisional Assistant Director of Planning Mr.N.Thamilchelvan, NECORD Community Development Officer Mr.K. Chandrakumar, Mr.S.Kumarakurupan of TRO, TRO’s Technical Officer, Grama Sevaka Officer Mr.A.M.Abuthalif and several others participated in the inaugural event.